Well, it’s been a nice run, guys. After nearly 10 years, Hibiki is closing down. I will keep the site up, but as has been the case for some time now, the site will not be updated. My boyscloud.net domain will be expiring in 2019 and because Hibiki is the only site hosted on it, I will be letting the registration expire. The site has instead been moved to archive.crosswithyou.net/hibiki and will remain accessible at this address. I appreciate all the support over the years. The Twitter and Facebook pages associated with the site will continue to be updated according to my whims. (They’ll likely be mostly RTs and shares.) I still listen to DGS weekly so I may post news now and then on these pages. Facebook no longer allows tweets to be automatically cross-posted so follow @dgshibiki on Twitter if you want to keep up with whatever I post. Thank you again for a wonderful 9 years and 8 months! HAPPY 39th BIRTHDAY, ONO DAISUKE! HAPPY 42nd BIRTHDAY, KAMIYA HIROSHI! HAPPY 38th BIRTHDAY, ONO DAISUKE! DGS wins Radio of the Year & Best Male Radio awards! Comments Off on DGS wins Radio of the Year & Best Male Radio awards! 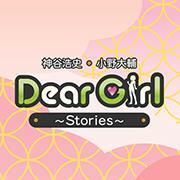 It was announced at Anime Japan 2016 today that Dear Girl ~Stories~ won both the Radio of the Year and Best Male Radio awards at the 2nd AniRadi Awards! Suwa san and UchiP were on hand to accept the awards. Congratulations! DGS began broadcasting in April of 2007. This past Saturday’s episode marked 9 full years on the air and next week will be the first episode of the 10th year.